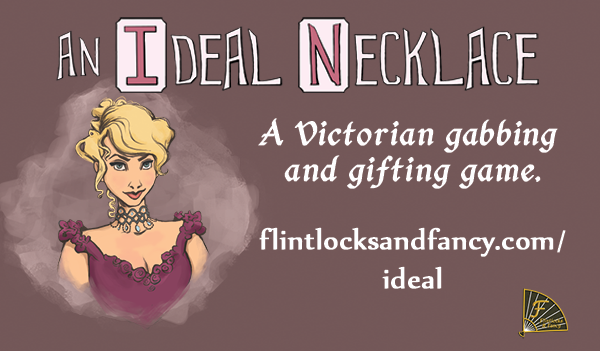 A Victorian gabbing and gifting game. 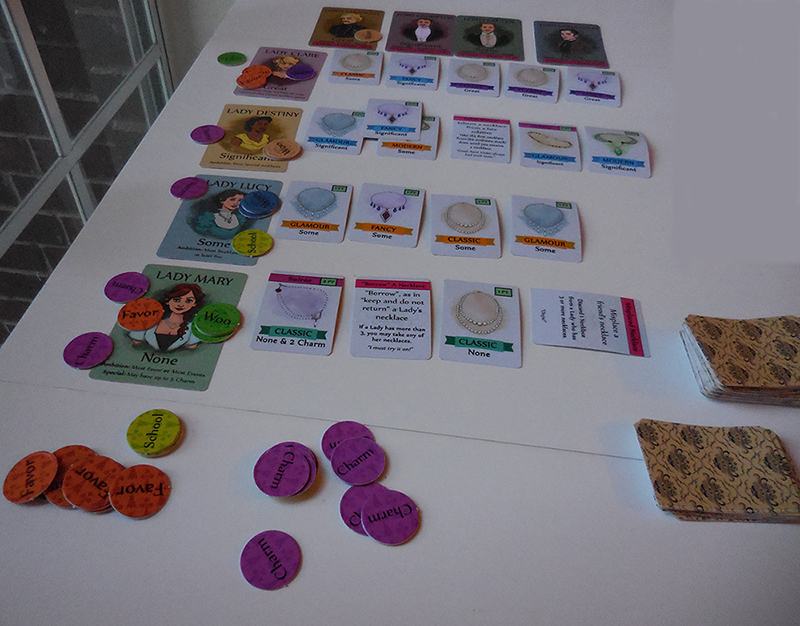 The Game was on Kickstarter from late-September 2015 to November 2, 2015. Coming to your home – Please contact if you have interest in the game, emailing us at this website’s email address at gmail. Individual copies can be sold or, if there is significant interest, there may be value in running another Kickstarter campaign. (Note: The published rulebook will have a slightly different layout with more images and the exact necklace counts may differ slightly) (The published rulebook will be color if a funding goal is reached; otherwise, it will be black and white). Gift necklace cards to gain Favor to Woo Lords to Win! Or, be a Spinster and just collect valuable Necklaces! 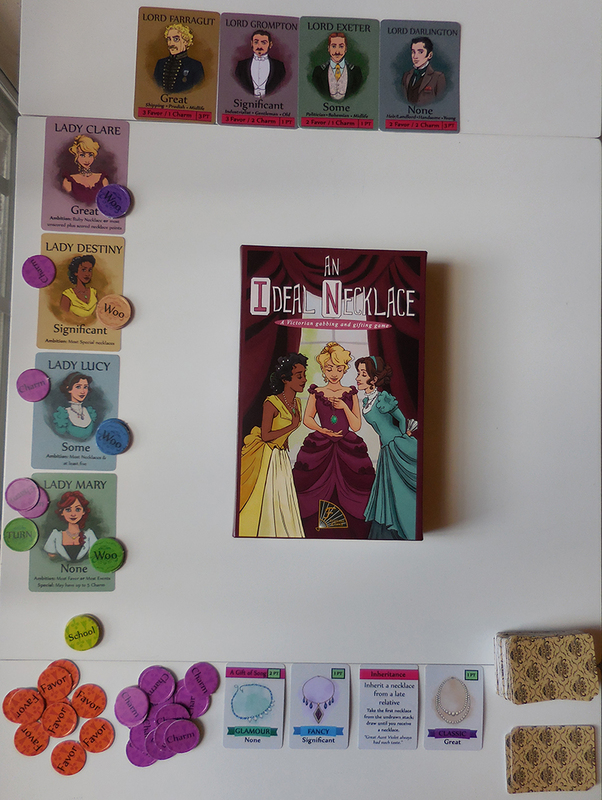 Play Events strategically, or Talk & Trade with others to adduce a cunning stratagem. Game Setup (c) 2015 Flintlocks & Fancy, LLC. 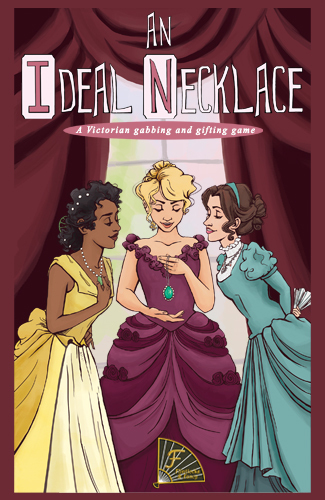 An Ideal Necklace, a Victorian-themed gabbing and gifting game allows one to four players to take on the role of Ladies on the hunt for fashion and husbands. A typical game plays in twenty-five minutes and can either be played socially or by-the-numbers logical deduction. Cards are visible to all, who may talk and influence other players’ actions. Ladies collect Necklaces, which they gift to others to earn Favor, which can be used, along with Charm, to Woo a Suitor, of which there are four. Once a Suitor has been Wooed twice, a Lady acquires him as a husband and after she also achieves her Ambition, she may end the game and begins scoring. An ambition is a goal, like acquiring the most necklaces, or gaining the most Favor. Email us at flintlocksandfancy, domain @gmail, or write a comment here with your contact information asking to be added to the email list if you would like to know about our releases.